As writers, the way we order each word is important. This thought came to mind on Tuesday after the screening of this week’s Channel 4 Dispatches. My husband’s friend, Robin Beste, pointed out that the name chosen by the filmmakers who approached the “cash-for-influence MPs” with their bogus lobbying company was called “Anderson Perry”. Geoff Hoon, Patricia Hewitt, Stephen Byers and others were being given a clue that this was a stitch-up. Perry Anderson was, for many years, the editor of the New Left Review and remains a prominent philosopher and polemicist on the British Left. He probably finds it amusing that his fore- and surnames had been transposed for this sting. Consider The Brothers Karamazov which has a very different connotation to The Karamazov Brothers. The former title carries gravitas, makes the reader think this is a classic Russian novel. Had it been given the same title with the two main words reversed, it could have been a circus act or the HBO sequel to The Sopranos. So the placing of each word is important. The poet Andrew Motion said, "Every time I peer into [the Oxford English Dictionary] . . . I think: All the words I'll ever need are here; the only thing I have to do is get them in the right order." While we’re talking about word order, I thought you might like to know that there is a book with a picture of Winnie the Pooh on the cover that teaches children how to bake. 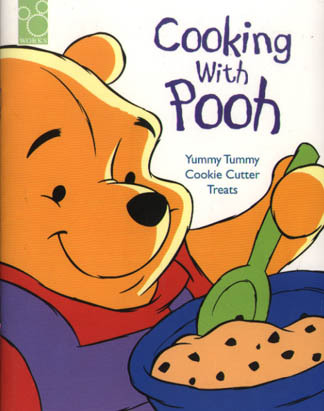 It’s unfortunate, but hilarious, that its title is Cooking with Pooh and offers the promise of “Yummy Tummy Cookie Cutter Treats”. The recipes in this cookbook would only be “yummy” if it had a different title. The ex-Cabinet Ministers who were so willing to offer their services “for hire” were either so beef-witted or greedy that they couldn’t foresee the poo they would be in. Stay tuned . . .